Going green is more than a trend and it's easier than you think! It takes little-to-no effort to get your boss, co-workers and office on board with becoming an eco-friendly office. There are many different ways that your office can both help and impact the ecosystem and what better way to get started on going green than on Earth Day! Not only is going green good for the planet, but it can also help your health and state of mind while at work. Read on to learn how you can help save the ecosystem while boosting your productivity and health in the workspace! Easier said than done, right? Wrong! Relying on email or project management systems can make an office completely paperless. Sharing links for online proofing or having meetings with shared screens will drastically decrease the amount of paper wasted in your office. According to TechRepublic 90% of all office waste is contributed by printed documents with revisions, corrections and updates on them. That's 90 percent! More paper gets wasted than food gets thrown out. 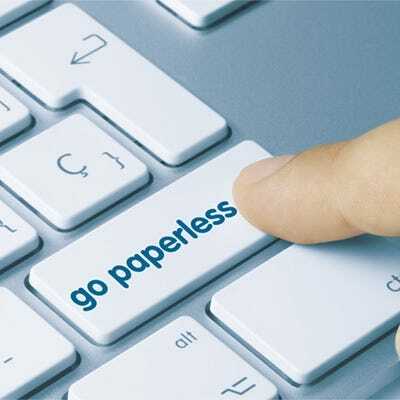 By reviewing paperwork online, using PowerPoints for presentations, and asking vendors for e-statements and digital invoices, you're well on your way to a paperless office! Bringing in desk plants not only help to brighten up your workspace and add some natural decor to the area, but it also helps to improve the indoor air quality. Plants help to offset any chemicals released into the air by producing more oxygen, which in turn makes for a cleaner and happier office for you and your co-workers. Need an idea for where to keep your plants? Read how we turned our Konnect Desktop Organizer into a succulent home to help reduce stress and sickness, as well as boost creativity and productivity! Soaking up the sun while indoors at work has tons of benefits for both you and the planet! Not only does natural light help support creativity and productivity, it also helps lower your office's electric bill and reduce energy consumption. Natural light can help change your mood because it sets the body's circadian rhythms, which control falling asleep, digestion, awakening, incorporating vitamin D. Being able to focus your eyes on the natural light outside also helps give those tired eyes a break if you're used to staring at a computer screen all day. Since it's not always sunny, it can be somewhat difficult to depend on natural daylight. In that case, you can still reduce energy consumption by installing a smart power strip at every desk, using timers and sensors for office lighting and replacing all lighting fixtures with LEDs. Looking for an alternative to overhead lights? Many of our desk lamps use LED lights AND replicate natural daylight. They might not be on your normal shopping list but eco-friendly office supplies are out there waiting for you to purchase them! Instead of throwing a pen out when it runs out of ink, save room at the landfill by buying a refillable pen. Surprisingly enough, rubber bands are quite the offenders since there are no green alternatives for them. Try using paperclips that are made from post-consumer content instead of a rubber band. Need an eco-friendly stapler? We've got you covered! Our EcoStapler™ Spring-Powered Desktop Stapler is made of 70% post-consumer content recycled plastic. Be sure to recycle used office supplies whenever you can! 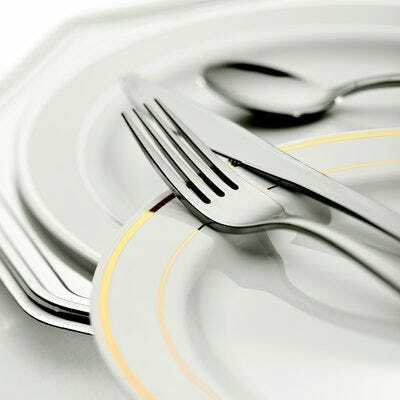 We know sometimes it can be a pain to have reusable silverware in the office because not everyone likes to wash dishes, however all that plastic silverware is doing major harm to the ecosystem! We've all heard of the no plastic straw movement so let's start saying no to plastic silverware in the office. According to One Green Planet, six million tons of non-durable plastics, like plastic silverware, are discarded every year. Plastic poses a dangerous threat to 700 marine species - all of which face extinction. 90 percent of trash that is found in oceans comes from plastic. If everyone in your office can come together and create a dish washing schedule, you'll be playing your part in saving the planet, the ocean and the marine species at risk. 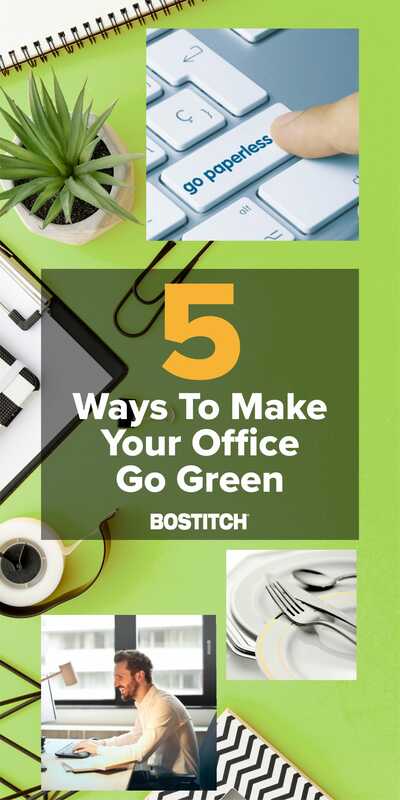 Of course there are so many more ways to go green in the office but these are just a few of our favorites that make going green easy and effortless! Find some more ways that work best for you and your co-workers and let us know how green your office gets by giving us a shout out on Twitter!